It has been seriously cold here this week in Dallas. So this Chickpea Vegetable Soup was in order. 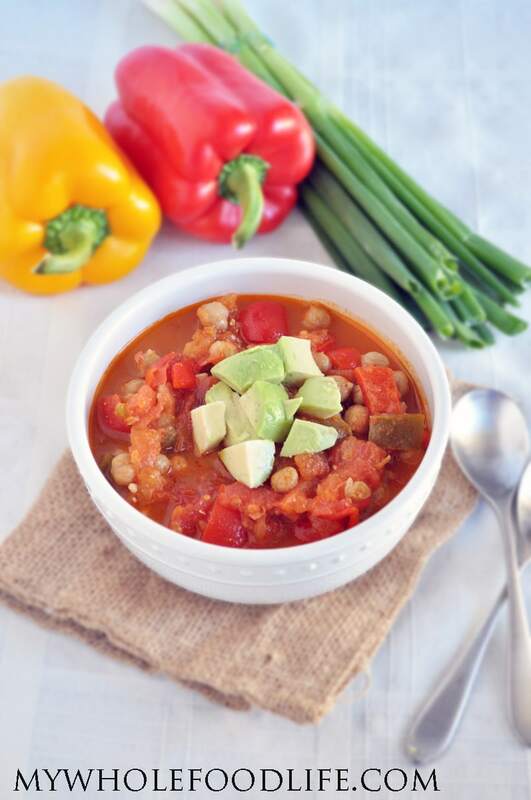 This Chickpea Vegetable Soup is super easy to make. You can make this healthy soup in your crock pot, or on the stove. Either way works great. This healthy vegetable soup came about when I discovered my peppers and tomatoes were starting to look a little wrinkled and soft. I wanted to use them up so I made this soup. I hope you enjoy it. If you like soups as well you may enjoy this post. I added the chickpeas to make this vegetable soup a complete meal. I also had tons of chickpeas to use up so they were perfect. This soup makes a large amount and freezes well. A hearty meal for those cold winter days! 2 cups dried chickpeas (soaked overnight) You can use canned chickpeas as well. If you choose to do that, it will be 2 15oz cans drained. Throw all the ingredients in a crock pot and cook on high for at least 5 hours. Store this soup in the fridge. It should last at least a week. You can also freeze it for longer storage. I topped mine with avocado. Yum! I love soup when it gets cold. The temperature here in Iowa has been in the single digits already. Brrrrrrrrrrr!! Your soup looks awesome!! Hi, I can't wait to try this soup. What would the substitute for the 15 tomatoes be in canned tomatoes? It would be about one 28 ounce can of diced tomatoes. If I were to prepare in pressure cooker, wonder how long it would take, anybody have any ideas? I have no idea. I don't have a pressure cooker. Just found this post a year later! I use a pressure cooker almost exclusively- it would take about 15 minutes on the highest setting. Let pressure come down naturally. It's in the crockpot!! Can't wait! I used canned beans.. U think I should do 5 hours on low rather than high? I would start on low and then turn too high if necessary. I hope you enjoy it!